The internet has a lot to answer for, that’s for sure, and one of those things is that it’s a lot harder these days to carry on a serious affair with a young cutie when you’re one of the most famous people in the world. But back in Charles Dickens’ day, you could get up to all sorts of hanky-panky and, if you were careful, keep it at least somewhat secret. The appetite for rumour and gossip was there – indeed, the tabloids of the day truly relished scandal every bit as much as they do today – but not only were communications less all-encompassing and cellphones not only not ubiquitous but not even imagined, massive celebrities such as Dickens weren’t known by their visage outside of their own circles. Stephen King goes noticed; Charles Dickens could go un-noticed, despite being, in many ways, even more massive in his time than King is in his. There’s a great scene in Ralph Finnes’ second film as director, The Invisible Woman, that exemplifies this era-specific aspect of fame. Dickens is at a racetrack, and the race is over. As the crowd mills and he is happily enjoying the company of his friends unmolested, someone spills the beans. The next thing he knows, he is mobbed. But until they were told, nobody knew it was him. He could have been there… with his mistress. 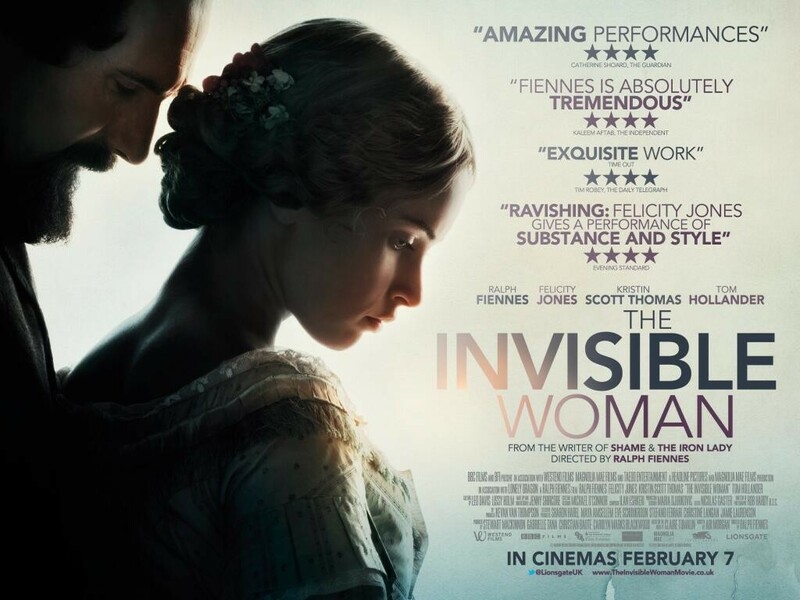 The Invisible Woman herself is Dickens’ mistress, Nelly, played perfectly by the stunning Felicity Jones, and how much you enjoy the film may be coloured by what you think of super-rich-and-famous married-with-ten-children authors having affairs with eighteen year-old young cuties. If such a thing repels you, you won’t find any sympathy at all with Fiennes’ Dickens, which I guess is fine. I neither loathed nor loved him; Nelly is the central character here and it’s her emotional journey you cling to. Of course, if eighteen-year old cuties who have affairs with super-rich-and-famous authors repel you, there will be no lead character here for you to like at all, and you’d best avoid the film entirely. You’d miss a solid, beautifully shot and acted, leisurely paced costume drama that ultimately can’t hide the fact that its central love affair is illicit. What I found fascinating was its depiction of just how an affair was run in such a situation – in those days, among such people. I won’t give anything away, but the level of complicity among certain people close to the participants is staggering. Or maybe I’m naive, and nothing’s changed.